Rex H.W. Albrexstondare was not a doctor, but he played one in Southern California. The pseudo-scientist claimed that he’d discovered the fountain of youth through proper diet and treatment, and had been restored from a 90-year-old man to a young man with a thick head of black hair. He said he’d grown four sets of teeth in his life. He was associated with a scheme to create a human body, saying he’d once crafted a 6 inch body, but had been unable to vivify it. He said he’d discovered a medicinal herb that could rejuvenate human life. And he claimed to be a Russian prince who had made millions during the regime of the Czar by devising a system of hydrating food. Yes, Rex H.W. Albrexstondare said a lot of things, and oddly, some people believed him. Unsurprisingly, the "doctor" made his living by preying upon women, preferably of the wealthy and lonely variety, and supposedly treating them for vague medical complaints, such as headaches and rheumatism. However thin his ruse may seem, the doctor found plenty of willing customers until 1923, when he hit a patch of very bad luck. It was then that Albrexstondare treated two Orange girls, Myrtle Thompson and Evelyn Rohrs, who suffered from congenital heart disorders. He gave them a paste made of mashed vegetables, alfalfa, and pea pods, which probably did the girls no direct harm, but certainly did them no good either. Albrexstondare was charged with practicing medicine without a license. Around the same time, a suit was brought by Jennie McFadden, a wealthy Altadena widow, who claimed that Albrexstondare had failed to repay over $20,000 in loans she’d given him over the space of a few months. He had befriended her, announced plans to embark on a course of scientific research, and set up a lab in her home. She periodically loaned him sums of money, which he perceived as gifts; he also claimed that during his stay, the 70-year-old McFadden made passes at him and tried to get him to marry her, as did her daughter. Others came out of the woodwork, and by the middle of 1924, Albrexstondare had three suits filed against him totaling over $35,000. But first things first. He was found guilty of the case involving the Orange girls (the jury’s deliberation took only 5 minutes), and was sentenced to 180 days in prison. He promptly set about raising the $3000 bond for his release. There was no mention of the party who’d finally given Albrexstondare the money for his bond, but he or she must have been too embarrassed to make a stink about it when he failed to appear for his sentence in May of 1925. On the lam for three months, he was finally apprehended in Ensenada and dragged back to Orange County to serve his sentence. Then in December 1926, things took a turn for the weird. Socialite and pianist Ruth Shaw, one of the women who’d previously filed suit against Albrexstondare back in 1924, pledged her loyalty to him and agree to help him with his legal troubles. This would mark the beginning of Shaw’s second career as a professional swindler and full-time accomplice. For reasons that were not specified, Jennie McFadden’s case did not come to trial until October of 1927, but Albrexstondare’s performance there may have been worth the wait. Prior to the trial, he and Shaw had hinted that they had some surprises up their sleeves, and today, the doctor let out all the stops. He claimed that he was beaten so severely in prison that he lost his hearing, memory, and consciousness of his surroundings for nine months. He said that Jennie McFadden and her daughter had threatened to use their wealth and influence to have him arrested, and that McFadden herself had engaged the agents who followed him from San Diego to New York City and finally, to Mexico while he was a fugitive (although he never saw himself that way). The judge didn’t see it this way, however, and ordered that Albrexstondare repay Mrs. McFadden’s money with 7% interest, as well as all court costs. You might that all of this would teach the doctor a lesson, or at least slow him down; however, Albrexstondare continued his schemes in Los Angeles with little variation or discretion for at least the next seven years. 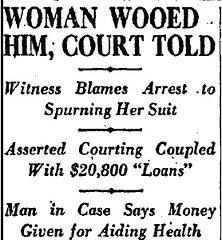 In May 1930, he was in trouble again, accused of swindling a woman who said she’d paid $275 for a medical treatment that she never received. Ruth Shaw, who’d lined up a string of gullible female clients for the doctor, was charged as an accomplice. Last heard from in 1934, the pair were still up to their old tricks. They were again charged with swindling for their efforts to separate L.A. residents from their hard-earned cash, telling them that they were raising funds to file a federal suit — allegedly, the $43 million fortune of the deceased Czar had been deposited to a San Francisco bank. And is it just my imagination, or does our own Nathan Marsak bear some small resemblance to the good doctor? Watch he doesn’t slip you any vegetable paste!